Common questions about traffic signs. This page is for educational purposes only. Q: Is it legal for someone to own a traffic sign? Q: How high should traffic signs be mounted? Q: Can I buy only one sign? Q: I don't see what I need on your website. Where can I find it? Q: I need a quote on a large order. Can I get better pricing than your website has? Q: How thick are traffic signs? Q: What is Reflective Sheeting? Q: What is Engineer Grade Reflective Finish? Q: What is High Intensity Grade Reflective Finish? Q: What is Diamond Grade Reflective Finish? Q: How heavy are sign posts? Q: What are traffic sign posts made of? Q: What shapes are used for traffic signs? Q: How big are road construction signs? A: This is a very common question. It is in fact legal for an individual to own a traffic sign as long as it was legally obtained, as long as it remains on private property off of a public right-of-way, and as long as the purchaser has a receipt of sale from the sign manufacturer to prove that the sign was legally obtained. A: Traffic Signs should be mounted in accordance with Section 2A-1 of the Federal MUTCD as set forth below. This figure shows seven examples of heights and lateral locations of signs for typical installations. The first illustration is labeled "Roadside Sign Rural District." The roadway is shown with no shoulder. The sign in this example is a Stop sign. The distance from the bottom edge of the sign to the level of the edge of the pavement is shown as a dimension not less than 1.5 m (5 ft). The distance between the edge of the pavement and the near edge of the sign is shown as a dimension not less than 1.8 m (6 ft). The second illustration is labeled "Roadside Sign Rural District." The road is shown with a shoulder. The sign in this example is a Curve Warning sign. The distance from the bottom edge of the sign to the level of the edge of the travel lane at the inside edge of the shoulder is shown as a dimension not less than 1.5 m (5 ft). The distance between the outside edge of the shoulder and the near edge of the sign is shown as a dimension not less than 1.8 m (6 ft). The third illustration is labeled "Roadside Sign Business or Residence District." The sign in this example is a Speed Limit sign. The distance from the bottom edge of the sign to the surface of the sidewalk is shown as a dimension no less than 2.1 m (7 ft). The distance from the edge of the pavement to the near edge of the sign is shown as a dimension no less than 0.6 m (2 ft). The fourth illustration is labeled "Warning Sign with Advisory Speed Plaque Rural District." The road is shown with a curb along the outside edge of the pavement. The sign in this example is a Curve Warning sign with a 25 MPH advisory speed plaque mounted below. The distance from the bottom edge of the secondary sign to the surface of the pavement is shown as a dimension of not less than 1.2 m (4 ft). The distance from the pavement edge to the near edge of the Warning sign is shown as a dimension not less than 1.8 m (6 ft). The fifth illustration is labeled "Roadside Assembly Rural District" and shows the placement of a roadside assembly consisting of several route markers and directional arrow markers. The distance from the bottom edge of the lowest sign to the pavement is shown as a dimension not less than 1.5 m (5 ft). The distance from the pavement edge to the near edge of the closest sign is shown as a dimension no less than 1.8 m (6 ft). The sixth illustration is labeled "Sign on Nose of Median." The sign in this example is a vertical rectangular white sign with a black border and legend. At the top left corner of the sign, a depiction of the plan view of the nose of a traffic island is shown. An upward-pointing arrow is shown on the sign, curving to depict movement to the right of the nose of the island.. The distance from the bottom edge of the Warning sign to the pavement is shown as a dimension not less than 2.1 m (7 ft). The distance from the bottom edge of the object marker to the pavement is shown as a dimension not less than 1.2 m (4 ft). The seventh illustration is labeled "Overhead Mounting" and shows an overhead mounting of a Directional Guide sign. The roadway is shown with a 1.8 m (6 ft) shoulder. The distance from the bottom edge of the sign to the pavement and shoulder is shown as a dimension not less than 5.2 m (17 ft). The distance from the nearest edge of the shoulder to the nearest side of the roadside pole supporting the overhead sign is shown as a dimension not less than 1.8 m (6 ft). A note at the bottom of the figure states "See Section 2A-19 for reduced lateral offset distances that may be used in areas where lateral offsets are limited, and in urban areas where sidewalk width is limited or where existing poles are close to the curb." A: Yes. Unlike many of our competitors, we do not charge a minimum order or any minimum order fees, so we will be glad to sell you just one sign. Although our website does have many products on it, there are just so many different signs that it is impossible to put them all in our store. We only list our most popular signs and sizes on our website. 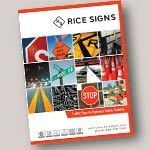 We can manufacture any traffic sign. Please give us a call at 1-888-728-7665 and we can help you out. Yes. For large orders please email us and we will be glad to provide a quote. A: MUTCD, or the Manual on Uniform Traffic Control Devices, is a set of standards issued by the Federal Highway Administration. The MUTCD was developed to ensure that all traffic signs are identical and comply to the same standards. A: The thickness of traffic signs varies. Most standard signs, and the ones for sale on this site, are .080" thick. However, we also manufacture signs that are .040", .063", .100", and .125" thicknesses. A: Reflective Sheeting is the material placed over the bare aluminum on traffic signs to make them reflective. Sheeting comes in Engineer Grade, High Intensity Grade, and Diamond Grade (see below for details). Most people think that highway signs are painted, but the finish is actually the reflective sheeting. A: Engineer Grade Reflective Finish is the standard reflective finish put on traffic signs. This is also the cheapest and least reflective option, but is also the most common. A: High Intensity Grade Reflective Finish is more reflective than the standard reflective finish, engineer grade. High Intensity sheeting is more expensive than Engineer Grade sheeting, and is also more reflective. It has a honey-comb type pattern. A: Diamond Grade Reflective Finish is the most reflective finish that is put on traffic signs. This is also the most expensive option for sheeting. A: Sign posts are typically 2 lbs per foot. 3lb/ft and 4lb/ft posts are available as well. Q: What are sign posts made of? A: Sign posts are typically made out of high-carbon steel. However, some tubular sign posts are made of aluminum. A: Shapes of Traffic Signs are set forth in Table 2A-3 of MUTCD. A copy of the table is below. A: Diamond shaped road construction signs are typically 48"x48". Although this size is not on our website, we do manufacture them. They are not available for online ordering due to the fact that they must be shipped by motor freight and a freight quote must be issued.